Private Parties - Seasonal Events - Loads of Fun! Richmond Virginia, Welcome to So Van Gogh! Let us help you have a great night out! 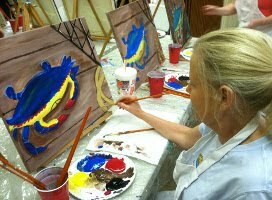 Book a private paint party where we come to you and have our instructors walk you and all your guests through painting a masterpiece, or, bring your special someone out to one of our seasonal paint class events. At So Van Gogh!, everyone leaves with a masterpiece and we will guide the group through a step by step painting from our gallery and you will leave with a beautifully finished painting! Our services are great for date nights, birthdays, reunions, and bachelorette parties. Call or email us and we can get you started right away! Have a fun Night Out, and create a masterpiece!